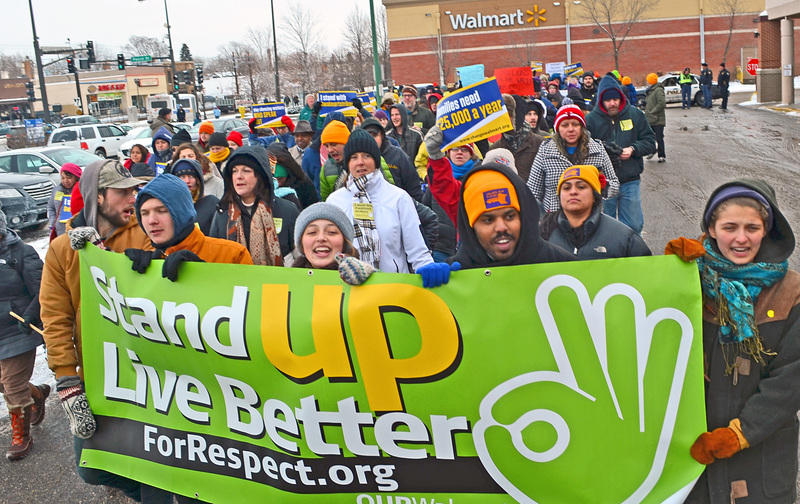 Demonstrators in the Twin Cities yesterday echoed an expansive call put forth at Black Friday actions across the country to lift workers and their families out of poverty by guaranteeing livable wages, access to earned sick time and a path to forming a union without fear of retaliation. The target of most Black Friday protests nationwide was, as usual, Walmart, which saw strikes or demonstrations at an estimated 1,600 of its U.S. locations. Walmart strikers from Apple Valley are, L to R, Cantare Davunt, Kelsey LaMott, Jordan Berg and Lisa Austin. 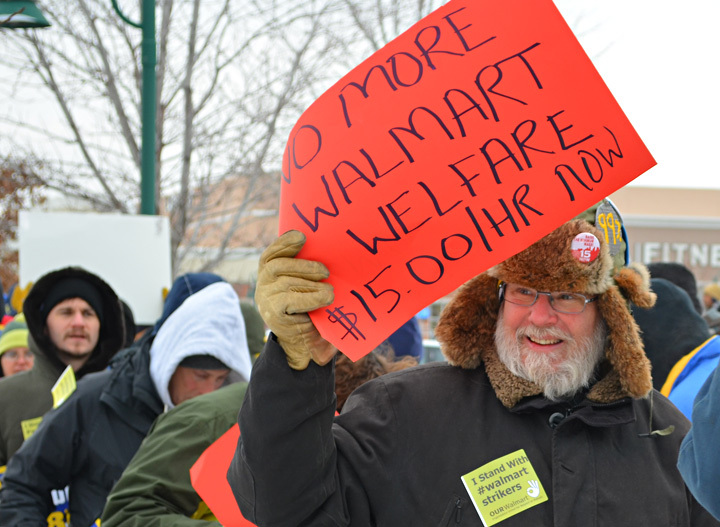 In the Twin Cities, 500 demonstrators marched on the Midway Walmart in St. Paul, supporting four workers from Apple Valley who wrapped up a three-day strike on Black Friday. The strikers, Lisa Austin, Jordan Berg, Cantaré Davunt and Kelsey LaMott, are members of OUR Walmart, a worker-driven organizing effort to raise wages and improve working conditions. 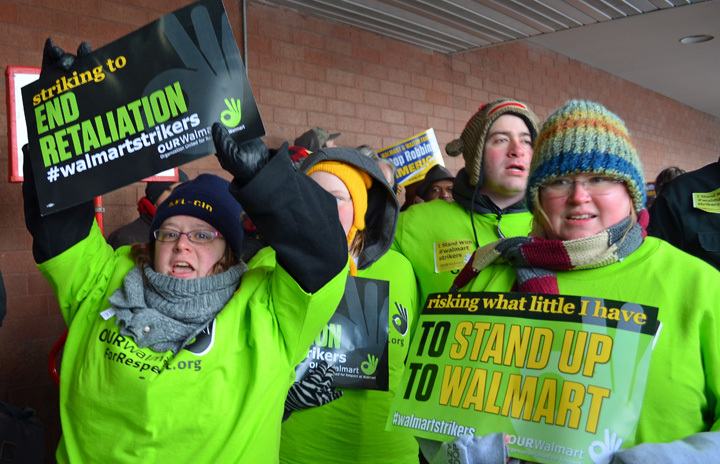 The strikers cited a variety of reasons for joining the OUR Walmart action. Austin, who works nights because she and her husband can’t afford child care for their 6-month-old baby, said she’s tired of being denied time off on weekends when her husband leaves for National Guard training. For Berg, the last straw was being written up for an emergency trip to the bathroom, considered an “extra break” by management. LaMott, who has four years of experience working for Walmart, is autistic, and she said she has faced insensitive and harassing remarks related to her disability. “Nothing is going to change if you don’t stand up and fight for it,” she said. Berg called the community support “amazing” and said it reaffirmed his decision to go on strike. “We’re a little worried about management retaliating, but if they do, we know we’ve got people who will fight with us,” he said. “It’s great to know how many people came out here to support us today, and it really does mean a lot to us. 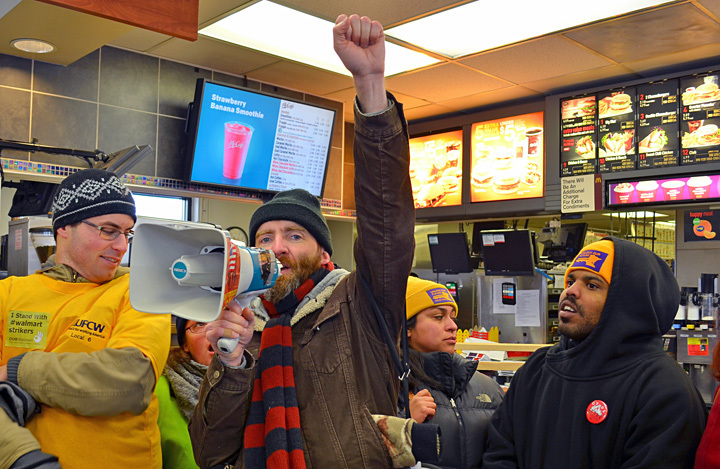 From Midway Walmart, demonstrators marched to the McDonald’s on University and Snelling, which they briefly occupied. Inside, McDonald’s worker Guillermo Lindsay called on the company to raise wages for its frontline employees and provide access to paid sick time. Lidsay is one of 29 workers from 14 fast-food restaurants in the Twin Cities who went on strike in September. They are organizing with CTUL, the low-wage worker center based in Minneapolis, for higher pay, improved working conditions and the right to form a union. Guillermo Lindsay (R) is a McDonald’s worker active in CTUL’s organizing campaign. He says workers coming in while sick is a problem at the restaurant where he works. A coalition of Minnesota non-profits, unions and faith groups – many represented at the Black Friday march – plan to push state lawmakers, when they return to the Capitol in January, to pass legislation increasing Minnesotans’ access to earned sick time. Members of CTUL, a Spanish acronym for Center for Workers United in the Struggle, who clean big-box retail stores, meanwhile, organized an early-morning picket line yesterday at The Quarry shopping center. Workers employed by cleaning contractors that service 50 stores across the metro joined the strike, and more than 150 strikers and supporters walked the picket line. The workers are demanding that retailers like Home Depot, Best Buy, Kohl’s, Sears and other stores follow the lead of Target, which entered into a groundbreaking agreement with CTUL earlier this year. The “Responsible Contractor Policy” requires Target’s cleaning contractors to enter into a dialogue with workers about scheduling and conditions, and provides a pathway to organizing a union. “It is time for all of the cleaning contractors to partner with workers to raise standards across the industry,” Maricela Flores, a retail janitor and CTUL member, said. “While we are hopeful about ongoing dialogue with some cleaning companies, we want to be clear that words alone don’t put food on our plates.